Home Health Can Poor Gut Health Cause Weight Gain? Full-fat gourmet cheeses, red wine, chocolate and coffee… These, according to the latest research, are just some of the foods and drinks that can help us stay healthy by fostering the health of the trillions of microbes – or microbiota – that live in our gut. “Your gut is literally teeming with microbes, which are crucial to health and well-being,” says Tim Spector, a genetics professor, whose work and book, The Healthy Gut Handbook, are responsible for the headlines about the power of gut microbiota and how it affects different aspects of our health, from putting on weight to how well we are able to fend off infections. Professor Spector has spent a lifetime studying twins to identify the roles genes and the environment play in health and disease. The results of these studies have convinced him that the microbiota holds the key to healthy weight, as well as overall health and well-being. Full-fat, unprocessed, artisanal cheeses – think Camembert, Roquefort, and Brie, rind and all – can contain more than 400 species of bacteria, including lactobacilli, which, according to research, can help reduce “bad” cholesterol. Aim for 30g a day. Pick fruits with skin and pith, such as apples, pears, bananas, oranges and berries. Tuck into vegetables, especially Brussels sprouts, broccoli, carrots, beetroot, spinach and artichokes, and also pulses. Go for pickles (naturally fermented with bacteria, not vinegar) and fermented dairy items like yoghurt and kefir (similar to buttermilk), as well as sauerkraut, and microbe-rich kombucha drinks. 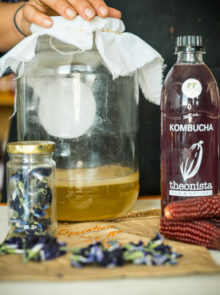 Try Clearspring Bio Kitchen Organic Sauerkraut, R69 for 360g; and a kombucha drink like Theonista Activated Charcoal & Lemon Kombucha, R33 for 330ml (both from Faithful-to-Nature). Make your own drinking yoghurt using Milk Kefir Grains, from R160 (from The Pro Health Shop) – just add milk to the grains and leave to ferment. 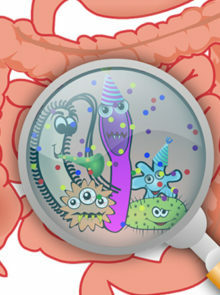 Prebiotics are fibres that you can’t digest, but gut microbes can. Leeks, garlic, bananas and artichokes are rich in them. 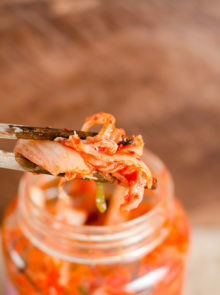 Probiotics are “live” bacteria and yeasts that may help restore microbial balance – they’re found in fermented foods, added to yoghurt drinks, or available as supplements. Polyphenols are plant chemicals that promote growth of good bacteria – and block the growth of bad. Found in coffee, tea, citrus fruits, grapes, berries, garlic, onions, pomegranate, and chocolate (the darker the better). Be sure to get your five-a-day of fruit and vegetables, but the more the better. Then limit red meat to once or twice a month and choose chicken and fish instead. Why? Eating red meat regularly is said to encourage growth of gut bacteria that convert L-carnitine, a nutrient found in red meat, into a compound that may hasten furring of the arteries. Starch that resists digestion and feeds friendly gut bacteria. Found in seeds, pulses, green bananas, potatoes, and al dente-cooked, cold rice. In the American Gut Project – Professor Spector’s twin study – the strongest factor affecting the richness of gut microbes was how much exercise participants did. Experts don’t yet know how much exercise is ideal, but half-an-hour a day of moderate exercise, five times a week, is needed for a healthy heart – and healthy body, which has a ripple effect on your gut. Wine contains lactic-acid bacteria, which is similar to those in yoghurt and other fermented dairy products, and is also a good source of polyphenols. Red is best – a Spanish study found one-and-a-half standard glasses a day for a month boosted good gut bacteria – white and rosé less so. “One or two small glasses a day is probably optimal, although we don’t know for certain,” says Professor Spector. A small glass is 125ml. A speck of dirt is essential for healthy gut bacteria. “Yes, wash hands after going to the loo, but steer clear of anti-bacterial products. Lightly wash fruit and veg, but don’t be frightened by a bit of dirt,” says Professor Spector. Overuse is leading to antibiotic resistance. But that’s not all – antibiotics don’t only take out the bad bugs, they also see off beneficial ones. If you absolutely have to take them, take a course of probiotics, too.